Living so close to Manchester I could have been witnessed its music scene and how Factory Records and the Hacienda Club helped change the face of youth culture. However if you cut me open you’d find the layers of tweed and corduroy that constitute a nerd. I’d rather have a tooth out by pliers than go to a nightclub and wasn’t keen on Joy Division, New Order and Happy Mondays. However I know these things meant much to thousands of people not even locally but across the country (while visiting this plaque a man from Essex was also taking photos while up here on business.) When a Japanese friend visited Manchester the first thing she wanted to see was where the Hacienda had once stood. 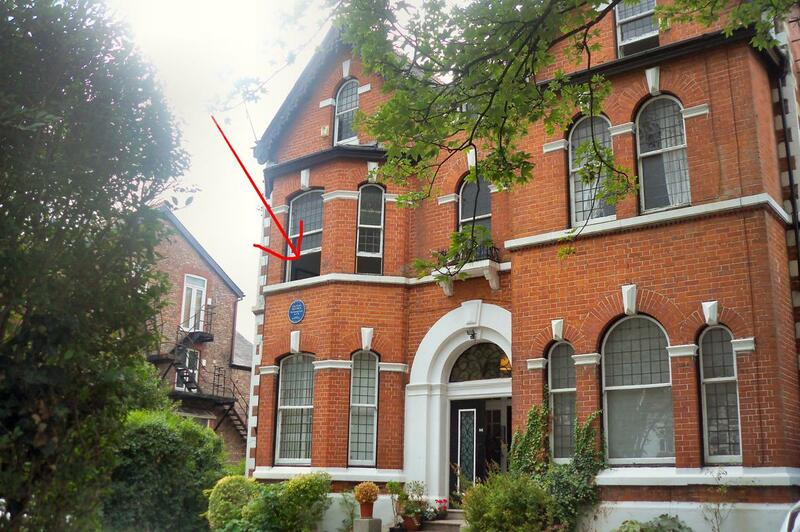 The blue plaque has been bolted to a flat on Palatine Road in Didsbury where Factory Records co-founders Alan Erasmus and Tony Wilson set up a makeshift office. Factory Records started in 1978. The flat was the centre of creativity, from planning the Hacienda club (which opened on Whitworth Street West in 1982) to propelling unknown groups to stardom. The creative ethos that would create immense musical influence started as a homemade home-grown acorn on the table here at Alan’s flat. Later Factory Records moved to One Charles Street and many groups on its books ascended to commercial success – those early heady days where it all started were spent here at this flat. To learn more about the Factory Records story it’s worth watching the film 24 Hour Party People. Factory Records began in 1978 and was defunct by 1992.